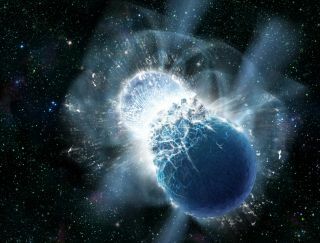 The collision of two neutron stars can create rare elements like gold. Image released on July 17, 2013. All of the gold on Earth might have come from cosmic crashes between superdense dead stars, new research suggests. The origin of the universe's gold is mysterious, since it's not formed within stars like lighter elements such as carbon and iron. But the mystery may now be solved, as a new study posits that the collision of two neutron stars — the tiny, incredibly dense cores of exploded stars — could catalyze the creation of the valuable metal. Berger and his colleagues studied a short gamma-ray burst — a class of explosions that are among the most luminous known in the universe — spotted by NASA's Earth-orbiting Swift spacecraft in early June. Called GRB 130603B, the gamma-ray burst was located about 3.9 billion light-years from Earth and lasted for less than two-tenths of a second. In the aftermath of the burst, scientists noticed that the explosion gave way to a gradually fading glow dominated by infrared light. The research team thinks the burst's glow comes from "exotic radioactive elements," which can be spawned by the neutron-rich material thrown out into the universe by colliding neutron stars. "We’ve been looking for a 'smoking gun' to link a short gamma-ray burst with a neutron star collision," co-author Wen-fai Fong, a CfA graduate student, said in a statement. "The radioactive glow from GRB 130603B may be that smoking gun." Gold is rare on Earth because it's rare in the universe. In all, the team expects that the gamma-ray burst ejected about one one-hundredth of a solar mass of material, with some of it being gold. "By combining the estimated gold produced by a single short GRB with the number of such explosions that have occurred over the age of the universe, all the gold in the cosmos might have come from gamma-ray bursts," CfA officials wrote in a press release today (July 17). The new study has been submitted to the journal Astrophysical Journal Letters. Berger presented the results today during a press conference at the CfA in Cambridge, Mass.